There’s very little useful/user-friendly information available online to someone asking that question. After trawling through a few websites aimed at school pupils, and Google books, I thought I’d provide a useful and hopefully accurate summary/answer, in an effort to fill that gap. 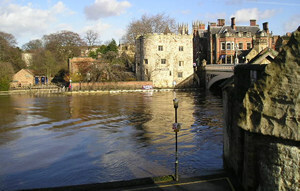 York is on the confluence of two rivers: the Foss, a smaller river, joins the Ouse just downstream of the city centre, past Skeldergate Bridge. At times of heavy rain, it all runs off the higher ground north of York rapidly and hurtles down the tributaries towards us, aiming for escape into the North Sea, via the Humber. It’s rather flat down here in the Vale of York (as the name suggests), which means the water spreads out a bit when it gets to us rather than rushing through. So York has always had a tendency to flood. This most recent and particularly dramatic flood occurred after a record amount of rainfall in a short amount of time. 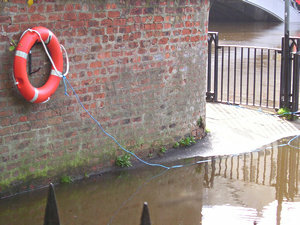 But the spectacle of a rising river spilling out beyond its usual confines is very common in York. If you’ve found clear, well-presented, authoritative information on York’s flooding problems, please add any links via the comments form below. York has always flooded… just go an look on the wall in Tower Street Gardens and you will see a record of the flood levels that have occurred over the 19th & 20th Centuries. The frequenccy of flooding has increased due to the CAP (Common Agricultural Policy). Back in the 19?0’s the agro politicians in Brussels agreed to pay large financial subsidies to “upland” farmers to install land drainage. The objective of this was to “improve the quality” of the upland areas by speeding up the removal of surface water from the land. A drier and firmer grazing means that cattle, rather than sheep, can be grazed where it was not previously possible. So the farmers of Upland farms have more productive land and everyone is happy! Except for those who are down stream of the farms that are draining the water of at a higher rate. The level of the Ouse and the rivers that flow in to it (Nidd, Swale, Ure etc)and the “shape” of the land has evolved over many thousands of years. The “Vale of York” is, in essence, a massive flood plain – stand on the viewpoint outside Crayke castle and you will see how flat the land is. In York we benefit from the remains of the Ice age and the Morains that form Siwards Howe (University of York), Holgate and Tadcaster Road and Windmill rise… however I digress…. So with all of this additional Water arriving much sooner, due to the Upland drains, it is obvious what happens – the Water rises quicker as the “profile” of the river bank is unchanged. In an attempt to “catch” this faster rush of water from the upland (Yorkshire dales) a number of flood plains were constructed to the north of York, to reduce the flow and subsequently release when the water levels drop. As to why we are having so much rain, well that’s another story! I myself am a student and this helped massively. Thanks! That was really helpful, THANKS!!!!!!!!!!!!!!!!! If you look at old photographs of York the river appears to have been tidal. This is before locks were added to make the River Ouse navigable at all states of the tide. These now act as Dams holding back the water and making it back up for many miles. Has anyone considered that this may cause problems upstream? this was extremely helpful and has helped me with my school project immensely, thank you! more serious future flooding for York from the long term fall in the surrounding area ground level (estimated average 1mtr.) due to the removal of the huge Selby coal seem. Strangely the seem was left intact beneath the Ouse bed, this will inhibit the drainage of the Vale of York flood plane. Government and NCB (or whatever they are now) kept silent re. this inevitable effect.